While the UBI market has grown to 14 million policies (as of March 2016), many insurance companies are still unsure as to what driving data is useful to them and acceptable to their customers. 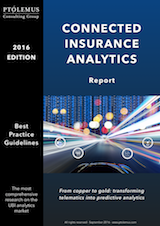 Many also feel unclear about the method to effectively transform the copper of driving data into the gold: an accurate risk assessment of each trip and a precise identification of the driving traits that impact the risk profiles. It is with that in mind that we decided to issue guidelines on the best practices in analytics. The guidelines detail the essential requirements for actuaries, marketers and data scientists to derive predictive, sensible and understandable conclusions from Big Car Data. The 20 best practices on deriving intelligence from connected insurance data include recommendations on how to record and process driving data, score drivers and interact with them. We hope you find them useful, please fill in the short form below. The guidelines will be sent to you by email.